Here are 50 of the best cheesecake recipes I could find. 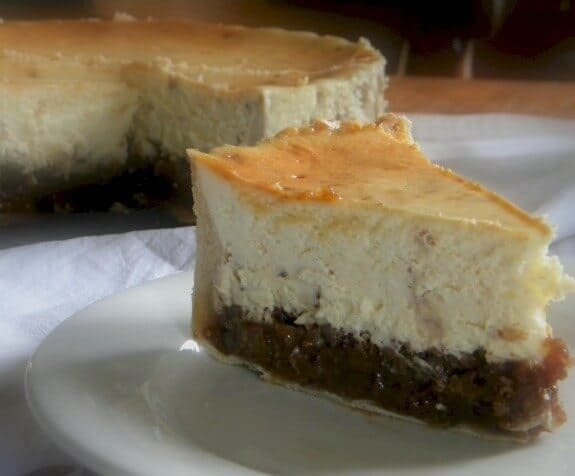 Dense, rich, creamy cheesecake. It’s one of those recipes that seems to be too difficult to make at home and yet it isn’t hard at all. Cheesecake comes in infinite variations and flavors, baked or no-baked, and is just as perfect for a fancy dinner as it is a family meal. I learned to make cheesecake when I was in my 20s and I loved it so much that I began selling them to local restaurants. Once you ind a recipe that you love, and that works for you, it’s easy to create variations. Cheesecake is expensive but don’t buy inferior ingredients or your cake just won’ be as good. Prebaking your crust will keep it from getting soggy. Always have all ingredients at room temperature. Beat the cream cheese until it is smooth and satiny before adding the rest of your ingredients. Never whip or beat the batter. Add eggs one at a time, mixing 2 minutes or so between each. ALWAYS mix ingredients at the lowest speed possible with paddles. You don’t want air getting into your batter. Give the pan a quick drop on the counter to release air bubble. A small drop…don’t stand on a chair or anything. three inches is plenty. Wrap the bottom of the springform pan tightly with aluminum foil so it is waterproof. Use the proper oven temperature. Don’t open the oven until it’s time to take the cake out. For some recipes this may mean AFTER a resting period in the closed, turned off oven. Don’t over bake! It should be slightly jiggly in the middle. Allow to come to room temperature before chilling overnight or at least 6 hours. Place paper towel on the top before refrigerating to absorb moisture. Store tightly covered and not with onions, garlic, or other strong flavors. Use a good cream cheese. I like Philadelphia because it always works for me. Leave the springform sides on until serving time. Then loosen the clasp slowly. If it seems to be sticking run a knife around it. Here are the 50 best cheesecake recipes on the Internet. The criteria for my choices? A balance between easy to make, unique flavors and styles, and clear instructions. The hardest thing about this list is which to make first. 50 Best Cheesecake Recipes Anywhere! I love the recipes..I tried the one for cheese cake over Christmas and my family love it! I’ve definitely got to step up my game and try the baklava and gingerbread cheesecake if I’m to think I’m any good at making cheesecakes. Thanks for such a variety of flavours! LOL! Don’t they sound great! Wow, not even sure where to start. But I know I’d love to taste test each and every one. I know. My dream job – being a cheesecake tester…. with a very high metabolism! What am amazing list. Pinning so I can reference later. Yum! Thanks for the list, I love cheesecake! You’re welcome! I love it, too. Woah! SO many awesome recipes! Great tips too , thanks! 🙂 thanks… how about starting at the top! LOL! Great cheesecake tips Marye. I always learn something new on your site. Like giving the pan a quick drop on the counter to release air bubbles…. What a great collection of recipes. Definitely saving these for later. Thanks! You can never have too many cheesecake recipes! SOmeday I am going to bake right through the list! You had me at cheesecake – and what a collection! Now – I just have to decide which to make first! I am pretty sure cheesecake is the best dessert int he world! So tasty and just MMMMM! Now to pick one to make! HUMMM Thank you for the list to drool over. Sure! There are some great possibilities! This is a great list and very inspiring. Cheesecake is certainly a favorite of mine and I love all the varieties! Just what I need! A list of cheesecakes! The savory Irish cheese and bacon cheesecake sounds intriguing, as does the Bailey’s — thinking of St. Pat’s which is just around the corner! Cheers! 🙂 Yep – cheesecake is definitely a favorite! OH NO! Fixing that right now! Link to Hot Buttered Rum Pecan Pie Cheesecake goes to Brownie Cheesecake. Sorry I wasn’t specific my last comment is referring to the red velvet cheesecake. I just want to say this looks absolutely amazing!! I will be making this for Christmas dessert this year but I do have a question. I wanted to do it as a take home treat so can I make it in small mason jars? Yes still following your directions of course. Thank you for your honest answer. Thanks for the link! I’m craving cheesecake now!